What Is the Principle of Parsimony in Biology? What Do Botany & Zoology Have in Common? What Is the Focus of the Branch of Biology Called Taxonomy? The focus of taxonomy is the classification and naming of organisms. Scientists classify organisms based on similar characteristics. In order to prevent confusion over what constitutes a similarity, biologists established a set of rules for classification. In taxonomy, organisms are placed into a number of increasingly specific groups and named according to strict naming conventions. The first thing scientists must consider when classifying organisms is what kind of similarities they have. Just because two organisms share a characteristic does not mean they should be placed into the same group. For example, both birds and bees fly, but they do so based on very different mechanisms. These types of similar traits are called analogous traits; they are used to perform the same function. However, biologists classify organisms instead based on homologous traits. Homologous traits are similar in their internal mechanisms. For example, the wing of an eagle has internal similarities to the wing of a flamingo. Biologists classify organisms according to a hierarchy of increasingly specific categories. This hierarchy was proposed by Carl Linnaeus in the 18th century. Linnaeus proposed seven categories of increasing specificity: kingdom, phylum, class, order, family, genus and species. While Linnaeus originally described only the plant and animal kingdom, other models include five or more kingdoms. Some modern taxonomic models also have a broader category called a domain above the kingdom. The most specific taxonomic category for an organism is its species. In general, this refers to a group of organisms that breed naturally within that group. Linnaeus also established strict naming conventions for all organisms. The scientific names of organisms involve Latin or Latinized versions of non-Latin words. These names are normally italicized when written The binomial version of the scientific name has two parts: the genus and the species. For example, humans are Homo sapiens. Homo is the genus, and sapiens is the species. The species name of an organism typically involves the first letter of the genus name followed by the lowercase species name. For example, the human species name is H. sapiens. 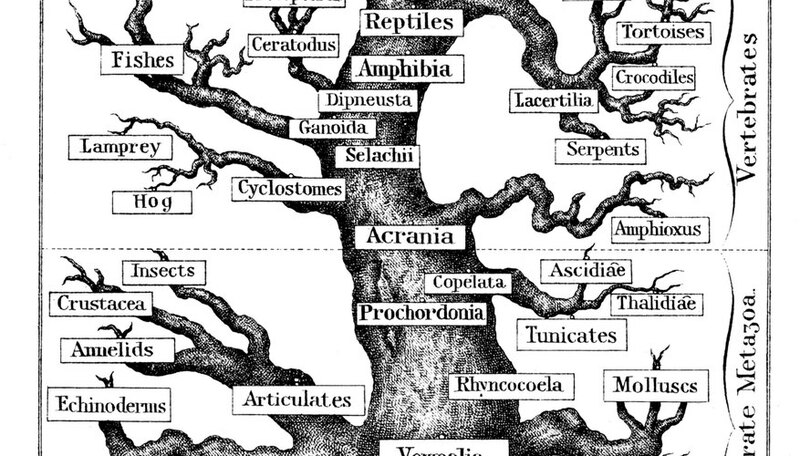 Taxonomy is contained within a larger branch of biology called systematics. Systematics is concerned with the evolution and relatedness of organisms as well as the classification. Hence, biologists use the data and classifications of taxonomy to build evolutionary trees for organisms. Biologists can construct these diagrams based on a number of different criteria, and these methods of diagramming can be used to generate hypotheses about evolutionary history. Serm Murmson is a writer, thinker, musician and many other things. He has a bachelor's degree in anthropology from the University of Chicago. His concerns include such things as categories, language, descriptions, representation, criticism and labor. He has been writing professionally since 2008. What Are the Parts of Microbiology? What Type of Animal Is an Octopus? Murmson, Serm. "What Is the Focus of the Branch of Biology Called Taxonomy?" Sciencing, https://sciencing.com/focus-branch-biology-called-taxonomy-18451.html. 25 April 2017.